While camping at The Pinery provincial park a few years ago, I took the green picture below, curious about the shrub. 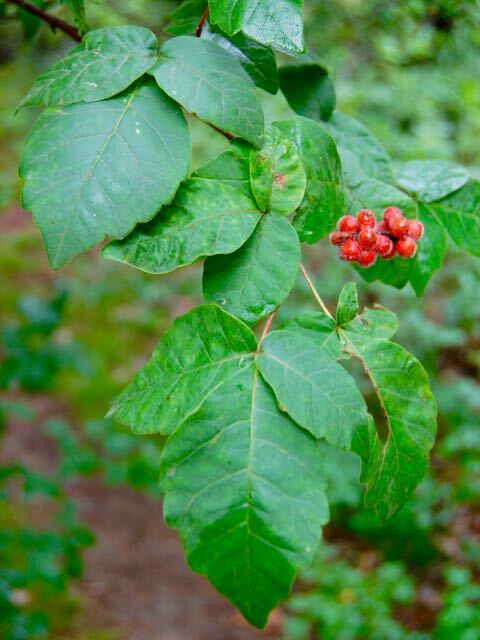 It had “leaves of three,” similar to poison ivy (formerly known as Rhus radicans, now Toxicodendron radicans syn. T. rydbergii) But those berries, if that’s what they were! Fuzzy, kind of like a staghorn sumac (Rhus typina). Turns out they’re all cousins. Call it a cousin-cidence. 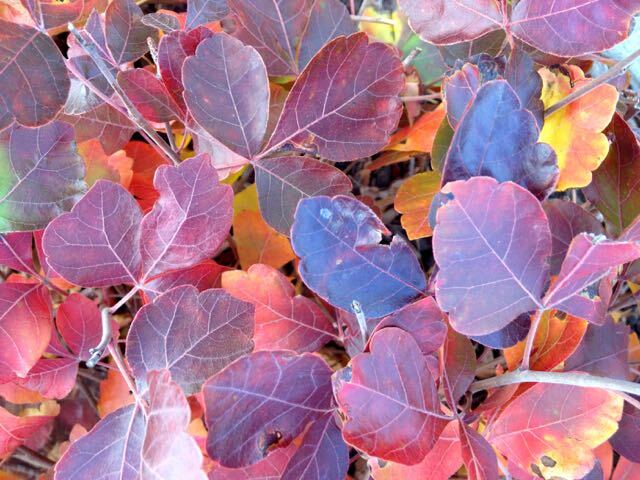 The shrub was fragrant sumac (Rhus aromatica). 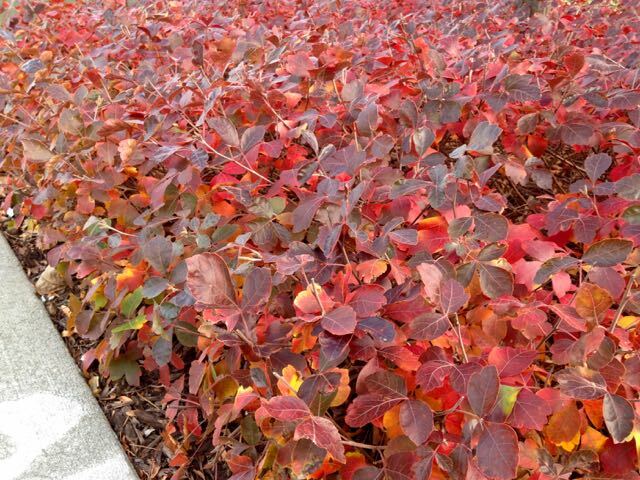 If you want great fall colour, and a native North American plant to boot, this may be the shrub for you. The taller species (approx. 5′ or 3.5m tall) is planted extensively along Lake Shore Blvd. East and around the new bus barn on Leslie. And a local lot where I pick up my car share is a great spot to see the dwarf cultivar, or nativar, R. aromatica ‘Gro-Low’ – a low-growing (surprise!) 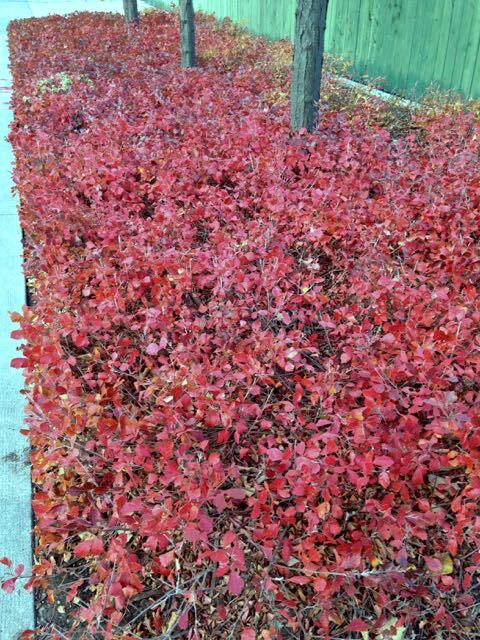 groundcover, not much taller than 2′ or 0.7m. The red-leaf shots were taken yesterday. 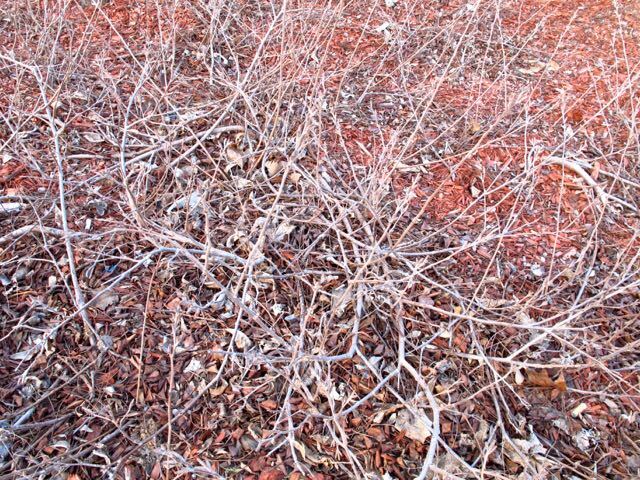 This is an adaptable shrub! It can take drought, poor soil, shade (though colours better in sun). Plus, it’s attractive to wildlife. Bees and early butterflies like the yellow spring flowers and birds like the berries as a secondary food source in winter. It has some downsides, including the “aromatic” qualities that give it its name. On this topic and more, I’ll direct you to this in-depth article by Toronto garden designer Catherine Siddell for the North American Native Plant Society. 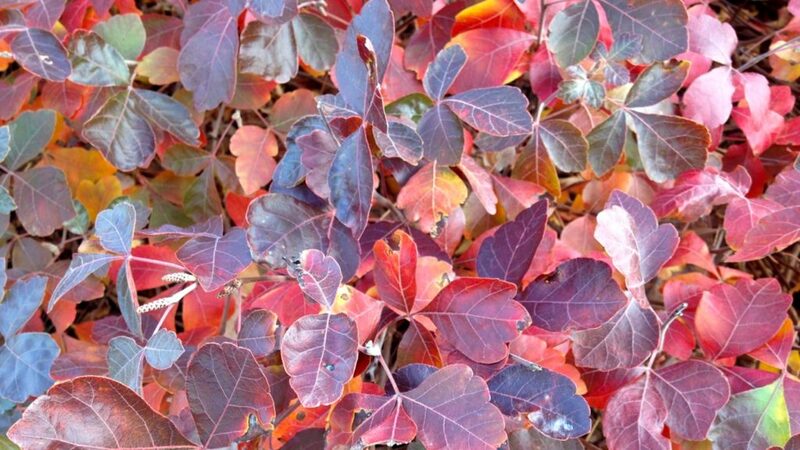 The shiny upper leaf surface gives interesting depth to the fall display, which can range from purple, through red, orange and gold. Viewing it from one side literally side-steps the glossy surface, intensifying the reds beneath. 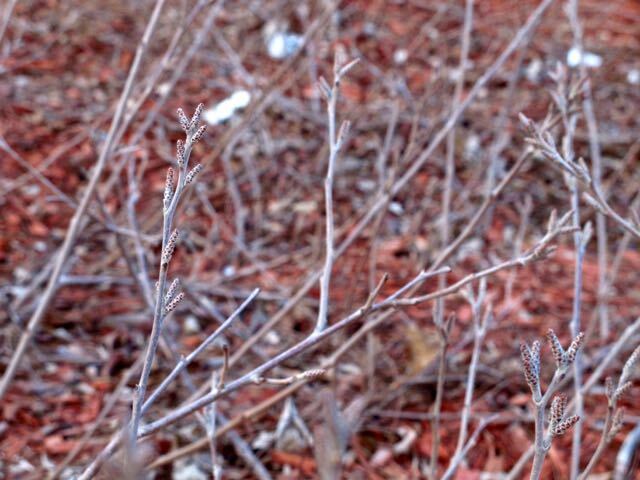 The one thing no one seems to mention is that when the leaves drop, what’s left is a tangle of bare stems all winter. If it were covered by snow, that wouldn’t matter. But you know January in Toronto, when snow can often be a no-show. 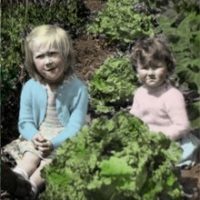 The pictures below were from early April back in 2013. Rather than the red mulch (grimace) at the Green-P below, I’d rake more leaves into the aromatic sumac patch. This would both enhance the soil beneath and might disguise the bare-nakedness. Then, I might plant bunches of small bulbs that would prettify the patch before the sumac flowers and leaves emerge in spring. See what I mean about the tangles? 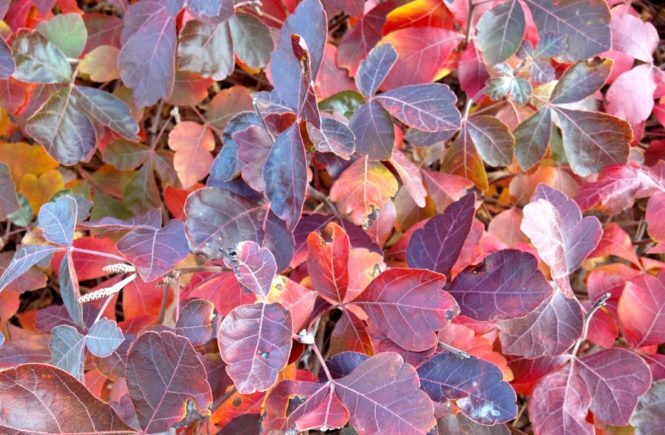 Fragrant sumac is a useful groundcover for tough areas – and I have one – with three strong seasons of beauty. It’s the bad-hair-day-all-winter that still has me hesitating. What would you do? I’ve not heard of fragrant sumac before (but have staghorn sumac up the wazoo in our wooded area). 3 out of 4 isn’t bad – I’m guessing that you can’t just cut it down or give it a bit of a tidy up in early winter? You can give it a bit of a trim to keep it tidier and contained. But I wouldn’t cut it back drastically on a regular basis. Perhaps a nice piece of sculpture or artfully arranged rocks would distract the eye over winter. A commenter on our Toronto Gardens Facebook page said he wouldn’t be bothered by the bad hair days, so perhaps I’m being overly fussy. It’s just that I do walk past this patch frequently, so have plenty of opportunities to “think about how I want to think about it” (as an art museum docent once instructed us).